Hosting business is a crazy place. With plenty of corporations fighting for every client, we see plenty of occasions when one company buys another. That is called acquisition. In theory, a big corporation purchasing additional assets should be helpful, as it gets more clients to work with and more services to offer. However, some of those acquisitions fail miserably. Here are some of my favorite ones – these failed acquisitions are not only interesting, but they also helped to shape today’s Internet and hosting world as we know it. GeoCities have more or less invented the modern Internet as we know it. Established in 1994, this Beverly Hills company has given everyone a way to create their own website. It’s been one of the first hosting providers that actually provided website creation tools to regular people. 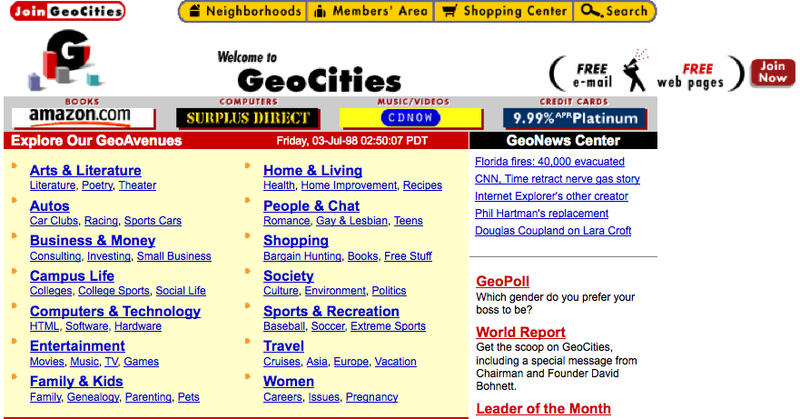 Divided into several “neighborhoods,” all different in topics, GeoCities has given the Internet users a platform to express themselves in almost everything they wanted. At the time of its peak, this website was the third most popular in the world. Then, GeoCities were acquired by Yahoo! and the rest was a disappointing lesson in history. The sum of purchase was an amazing 3.57 billion dollars in stock. That would translate to a whopping $5.36 billion in today’s money. However, to call an investment unsuccessful would be an understatement. In one of the first moves, Yahoo! has updated the Geocities Terms of Service, stating that the company owns the content posted on each of the GeoCities pages. That led to a lot of users leaving the platform for good. Later, Yahoo! has reverted its decision but the trust has been strained, and the popularity of GeoCities took a huge nosedive. The punches kept coming and soon, many users left either for social media websites, such as Friendster or MySpace or made their own message boards and personal websites. Yahoo! was not able to turn GeoCities into a viable hosting provider nor it managed to pioneer it to become a social media network. Stagnation is what eventually killed GeoCities in 2009. Now, it’s only available in Japan and is nowhere as big as it used to be. In 2015, GoDaddy announced it will start working on increasingly popular Cloud hosting services. In December 2016, the corporation has bought its main competitor in Europe – Host Europe Group – for $1.79 billion and boasted to use its PlusServer to lead the European market for small business Cloud services. However, both the technical challenges and the volatile market meant that this investment was short lived. 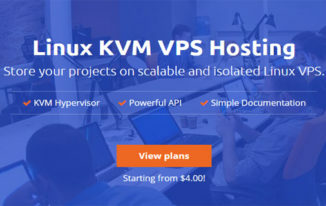 In July 2017 it was announced that the cloud servers would be closing by the end of the year. Therefore, GoDaddy has sold its cloud business for just a bit over $400 million. GoDaddy Senior Vice President of Hosting Raghu Murthi has been quoted to have said: “GoDaddy Cloud Servers provided numerous learnings for us that we’ve already been applying to other products and services”. It provided one more thing though – serious financial losses. Although it has to be said, it’s great to see GoDaddy accepting it may not be able to deliver A+ services and ditching the plans altogether. There are plenty of examples where acquisitions have led to a poor quality of services with almost no regard to clients. Speaking of examples of bad customer experience, there’s always Endurance International Group (EIG). This group has started in 1997 (as BizLand) but has started acquiring other providers in bulk since around 2010. To say that the corporation has a bad reputation would be like saying bricks are not particularly tasty. It is not wrong, but it also doesn’t fully describe the experience. The Internet is littered with one angry blog post after another as disgruntled users complain about their favorite web hosts going downhill after the EIG acquisition. 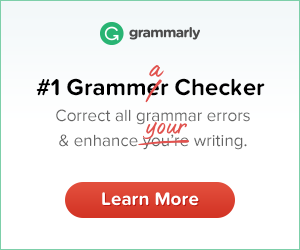 One of the bad examples is HostGator. Acquired for at least $225 million in 2012, HostGator was one of the most popular and reliable hosting services in the United States for many years prior to that. Check it out now and you will able to see how many angry posts about HostGator there are. Old users are blaming EIG for making the host slower and less reliable. Same can be seen about the other EIG acquisitions, such as Site5 or iPage. Very often, disgruntled visitors leave one of the EIG hosts and then conduct a web search trying to find a better one. Sometimes, these visitors just end up signing to a yet another EIG host, therefore, not leaving the ecosystem. After finally finding out what’s going on, they don’t only become disgruntled users. Some start seeing this group as an actual enemy, as they feel tricked and cheated. However, for EIG, these acquisitions are completely fine. They are increasing in size, and none of the hosts they’ve purchased have been a problem for them. Unlike in previous examples, the loser here is not the corporation – it’s the clients. Yet even here you can find a positive or two. Many bloggers and experts have noticed that between the EIG acquisitions, one of its hosts has actually become better. Bluehost reviews are sparkling with positivity and are increasing in popularity which allows them to keep hiring additional employees. But for now, we will know EIG as a group which has turned a lot of the hosting providers for worse. It will take a lot of work to turn those angry blog post frowns into smiles – the group has its work cut out for them. It is important to take risks. Probably nothing great was ever done without some kind of a jeopardy. Often, however, the risk has to follow up with constant improvement. The demise of GeoCities was expected and rather timely. The service staying the same for more than a decade simply made it irrelevant and not worth the ridiculous price tag. If the risk fails, it’s better to bail out early than set yourself up for heartbreak. GoDaddy and EIG approach to acquisitions couldn’t be any more different. GoDaddy tried to become better, then quickly owned up its mistakes and stopped the cloud services altogether. EIG, however, now has an incredibly bad reputation all around the world for what it’s doing. While financially, the group is still doing alright, there’s no denying that making your clients disappointed is in no way good. These are the most notable examples of failed hosting acquisitions we have right now. All very different, they paint a great picture of what does it take to become successful in this business. 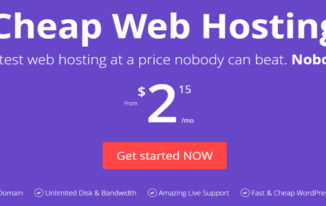 I never had an idea that companies will acquire web hosting companies too. In spending the amount for acquiring another web hosting, they could have invested in expanding their own. This is a really unbelievable post to know Web Hosting Company Acquisition fails. I really didn’t hear much about Acquisition Web Hosting but this article such means a lot to make aware peoples about Web Hosting Company Acquisition Failures.